Hi, welcome to our elections night coverage. Well, when I say night I actually mean night AND day. We're with you all the way bringing you the excitement, facts and craic from counts across the county as the next crop of MPs are revealed. We'll also be throwing in some of the more 'important' national stuff so that you get a bit of picture about what's happening elsewhere. And then after all that, we've got the local election counts across Cumbria. Perhaps the most eagerly awaited result from the locals is Copeland, where people have been asked to elect a mayor. 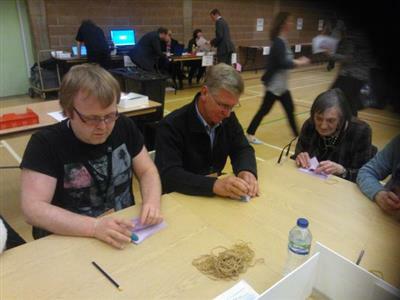 There are also local election counts in Carlisle, Eden, Copeland and Allerdale. is there any links up yet to keep track of the local elections for like dalston, denton holme, currock etc ? Nightowl - Not yet. We're aiming to put everything through this. So when the results happen, they'll be on here. We'll round everything up as we go as well. What all that means is that this is 'on air' until about 5pm tomorrow when we should know the last of the borough and city results. We are, however, expecting a bit of a lull between the last of the General Election results and the start of the local counts. If you can't stay with us through the night, make our websites your first port of call in the morning. They'll have full stories, results, reaction and photos from the counts. We're not producing a special edition of the News & Star tomorrow but we are printing the Late Final edition of The Cumberland News much earlier than normal. The presses start rolling at 9am and it'll be on the streets soon after that. But enough about what we're doing. We want YOU to get involved and take part over the next 18 hours or so. If you've got a question about what's happening where locally, ask it. We'll put it to our team of reporters and photogs (mobile comms issues allowing) and get you the answer as quickly as possible. Just so you know, there are two of us here in CN Towers in Carlisle - Ian and Chris. At the Carlisle count we have reporters Nick Griffiths and, a bit later, Jonny Irving and photographer Dave Hollins. We've got a different team covering the local elections count tomorrow. At the Penrith and The Border count we have reporter Kelly Eve and photographer Stewart Blair and Duncan Bick will bring you the details of the Eden council elections later on Friday. In Workington, we've got Nicole working on this while reporters Sarah Moore and Federica Bedendo and photographer Tom Kay are busying themselves at the count. 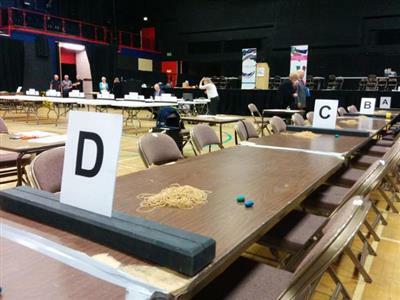 In Copeland, Andrew and Mark are working through the night (and most of tomorrow) to keep you up to date with goings on at the count in Whitehaven Sports Centre. Interesting #elecs2015 exit polls. Show Conservatives way ahead. Will @John4Carlisle be among them? Or will @MissleeCarlisle win for Labour? Sarah says postal votes are being reverified at Workington - they've already been verified and the first ballot boxes are arriving from polling stations. Candidates are also starting to arrive. The only non-parliamentary results we'll get during the early hours are for some of the Carlisle City Council seats. Votes from four of the 19 seats are validated in Penrith and the Border so won't be counted until Friday afternoon. All other results - Copeland mayoral vote, Copeland council election, Allerdale and Eden elections and election to first Penrith Town Council - are expected to trickle through during Friday afternoon. 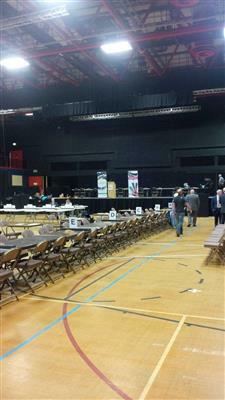 Copeland mayoral result is expected early afternoon. In addition to all that, there are parish council elections as well in different parts of the county. Interesting early predictions from the first parliamentary exit poll. Poll puts the Conservatives ahead on 316 seats, with Labour on 239 seats, the Liberal Democrats on 10, the SNP on 58 and Ukip on two as counting begins.If borne out by results, it would leave the Tories 10 seats short of an overall majority but ahead of its result in 2010. Labour would be down 19 seats on their result last time as the SNP were forecast to make sweeping gains of all but one Scottish seat. #elecs2015 Exit poll suggests Tories will get 316 seats,Labour 239,Lib Dems 10, the SNP 58, Plaid Cymru 4, UKIP 2 and the Greens 2. Driving into the office this evening, there were the last few voters drifting out of polling stations in Carlisle. Indications earlier today were that turnout had been strong. What was it like where you voted? Let us know. While we're mulling over our food dilemma, perhaps you could tell us what you're doing for election night. Are you following what's going on while at work? Are you having an election party? 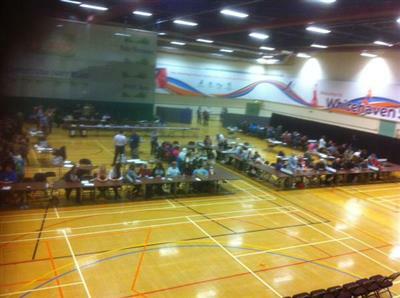 First ballot box has arrived in Workington - from Harrington. There have been 16,657 postal votes sent in. I'm having peanut butter sandwiches in Workington, Ian.